I feel the breeze through the door. I finish my coffee, umbrellas to and fro. Chris Martin sings in my headphones, as there is no other playlist I would rather listen to on a rainy day. It is my favorite type of day to stare at a screen, write a blog and look out the window as the rain hits the ground. its a beautiful rainy fall day in Lisbon. WARNING: This post is long, but it has lots of pretty pictures. I'm only doing 1 post on London. Enjoy (even if you just scroll to see the pictures)! If you were to see my facial expression every day, it probably looked a little like this. I was told this is the closest I could get to Big Ben. In conclusion, street performers in London weren't really that good except for maybe this one BMX performance. I had to go to Buckingham Palace. I love this picture. I think I was 14 or 15 when this dream began. The first time I went to London was for my 15th birthday. Traditionally in Latin countries, when a girl reaches 15 its a major milestone. Many of my friends had Quinceañeras, I asked for a trip to Europe instead, with a stop in London. Shout out to Ms. Raulerson (now Mrs. Griffith), who loved teaching English class and introduced us to Shakespeare. 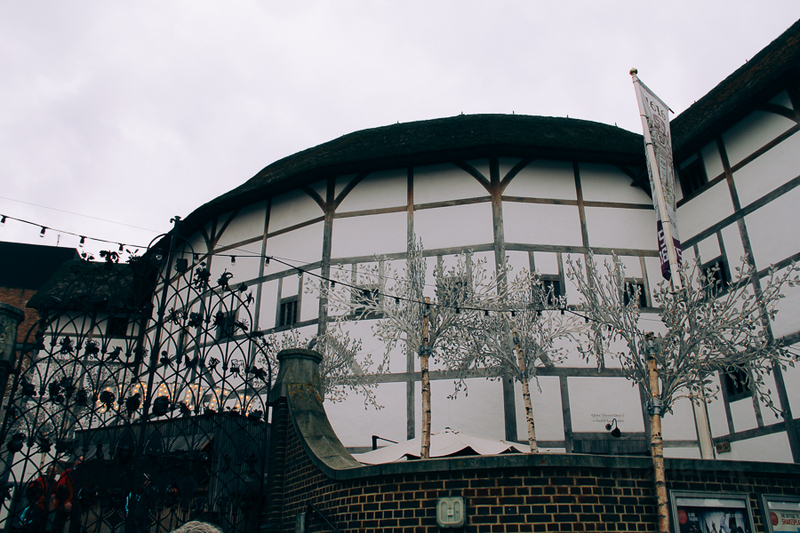 All that to say, I remember walking down the Thames and being so excited to be standing next to the Globe Theater. I was 14 or 15 when I began dreaming of going to college in a different country than my own England was the place, but God had other plans and I ended up in the middle of nowhere Texas, in a little town called Abilene (I wouldn't trade it for the world). This is my half scared, half exited face....A clown was walking towards me and my friend, so we quickly ran. Becuase I did not go to college in England, I tried doing a Study Abroad program with my university in 2009. EVERY DOOR WAS SHUT. It would have been a dream to study at Oxford for 3 months. It was at this point in my life that I felt resentful towards God and my dreams. I stopped dreaming (by that I mean, I stopped imagining what I would do after college, where I would go, what my life could look like, etc. etc.) for almost 2 years. I stopped living from a place where my purpose was informed by someone bigger than me. The drive, my passions seemed to die down for a bit, just because a dream I had didn't turn out exactly like I imagined it or when I wanted it. The story as to what sparked my imagination again is another long one, so for now we'll focus on London and the week I got to spend there. This one is for Mrs. Griffith (Ms. Raulerson), the one who taught me to love Shakespeare. I left Lisbon, and the 3 hours on the plane gave me plenty of time to sleep & think. I had forgotten about 2009, the year I was supposed to come to England. I remembered my disappointment on the plane, and even though I was just there for a week, I was thankful. In hindsight, I think I like smaller cities and don't really like the rain that much, so maybe that's why I've never lived there (thankfully during my trip it only rained once). I had one week to take the city in, to see the sites, to live like a local, & to be with friends. After traveling by myself for a little over a month, I had gotten to a point where I needed to talk to people. Not that I don't now, don't get me wrong I have friends here in Lisbon (it's the main reason I'm currently here-to build friendships and start a church); but I needed to be around friends who weren't necessarily new friends. I got to see 5 different friends from Nashville & Honduras on this trip. I didn't do any research, I just let my friends plan where to go and what to do. I landed, took a train from the airport, bought my Oyster card and hopped on the Tube. "Mind the Gap," I heard. I walked out of the station at 9pm or so, and the first thing I saw were some "blokes" standing outside a pub. I WAS IN LONDON (I'm trying to contain my excitement even as I write this). I was ready for the weeklong adventure of enjoying the city. 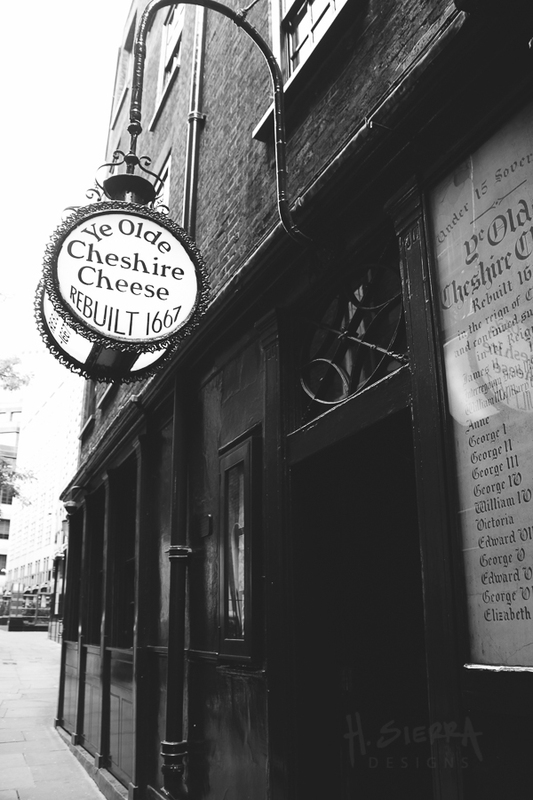 Later in the week, I happened to visit one the oldest pubs in the city: Ye Old Cheshire Cheese, who at one point was the hang out spot for people like Mark Twain. It was a Pub that was rebuilt after the 1666 fire and has been operating since. WHAT?!! So naturally I ordered Fish and Chips, because what is more traditional and stereotypical than that? It was great. I mean look at this place. We walked down tiny steps in what looked like caverns, and were welcomed by this lovely room. I was pretty happy about the fish and chips. Too many choices, but the sweet potato fries here were on point. The food options at Kingly Court were so many. Thankfully we ate at a Peruvian Restaurant that had awesome Latin food. This place was ridiculous. It was probably one of the most ostentatious places I've visited. Still fun to see. I promise I found a jacket that was worth as much as my college education. Towards the end of my time there I had been surrounded by buildings. I needed to see nature, everything made me feel black & white. I truly considered only posting black and white pictures. Thankfully London has beautiful parks throughout the city. I visited Regent's Park on two occasions and loved it. You could get a view of the whole city on one side, see birds by a lake in the other and enjoy a plethora of gardens. I also spent some time in Hyde Park (because it is huge and beautiful, and one of my best friends told me to go there). This girl just looked so cool. I had to take a picture. I said hi to the Queen, took a picture, and then headed to Hyde Park. It was a gorgeous sunny day, perfect to ride a bike, perfect to see more gardens & trees. I have been to many many movie theaters (one of the perks of having cheap movies in Honduras). Yet, it never crossed my mind that one day I'd go to a red carpet premiere. One of the days my friend was like, "Hey do you want to go to a movie?" "Sure," an easy answer. It just so happened that the movie was a red carpet premiere in London. We stood within an arm's length of Oscar winners. We got to see the producers & directors talk a little bit about their creations. We were in tourist attire, so no we didn't dress up for them, everyone else was, and it was still great. Both the films were great. I enjoyed their beautiful cinematography so go check them out when they come out: LaLaLand & Queen of Katwe. I have loved going to all the art museums during this Europe trip. I went to the Tate Modern, National Portrait Gallery, and the Victoria & Albert Museum. Landry taking a poster, that never made it outside the museum. Victoria & Albert Museum, all I had were pens and a little journal in my bag. Of course I joined for a short 5 drawing minute session. Within 2 rooms of each other I saw Manet, Monet, Van Gogh and Klimt. I had seen these works of art in my art history class in college or in other books I've read. In that moment it didn't matter that there were others around me, in that moment it was just me and the colors, the textures, and strokes: it was amazing. All the colors, all the movement, I was seeing a glimpse into the soul of people that created movements years before me, that affect the way I paint today. 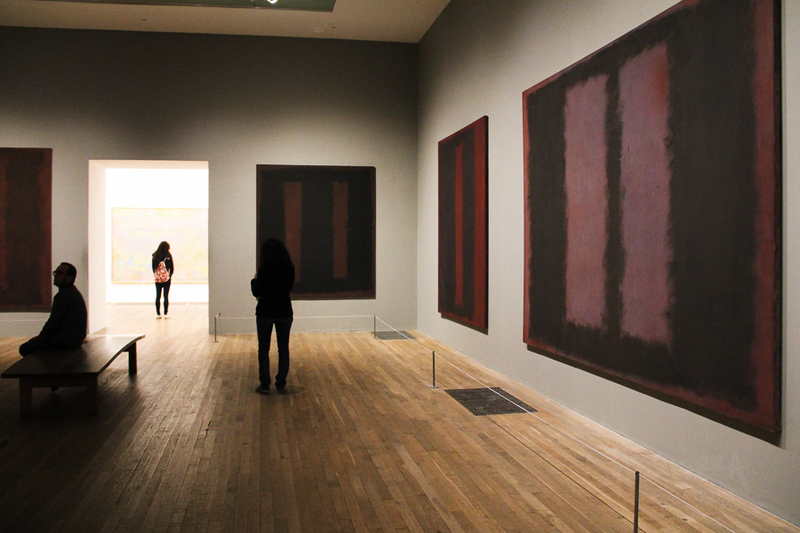 My last day there I met Rothko at the Tate Modern. I had been to the museum earlier in the week, but somehow we missed this room. I walked in (I recognized his name, Mark Rothko, but didn't remember his work). I saw big reds and purples. I fell in love with the color. Rotko what did you do to me? I could have probably stayed in that room for at least an hour. The size of the pieces was massive, I felt like an ant. I love seeing giant paintings, & I love making giant paintings. His use of red and purple in such a subtle way that married the colors together, was genius. Those paintings made me feel deeply (and purple is my favorite color, so maybe that's why I liked them so much). I told my dad I cried at a museum and he laughed at me. He laughed at the fact that I would understand a stroke and let it capture me to the point of tears. But that's the whole point of art isn't it? I hope that maybe one day someone cries when they see my work, that their heart stops beating a little, that they realize something amazing (whatever that may be) and their life is changed. I guess I'll just have to come back! Until Next time London! I got to hangout with friends from 2 of my homes, Nashville & Tegucigalpa. This trip would not have been the same without you. Thanks for hanging out with me and showing me bits and pieces of London. (Not pictured is my friend Jocelin...I guess I'll just have to go back for that one). "La historia entre tus dedos"
In case you were wondering here's a list of places I went to: Millenial Bridge, (Outside of) St. Peters Cathedral, Tower Bridge, London Eye, Big Ben (not as big as the movies, still big), Globe Theater (just outside sadly), Tate Museum, National Portrait Gallery, Victoria & Albert Museum, Picadilly Circus, China Town (not really a China Town), Liecester Square & the Theater District, Regent's Park, Hyde Park, Harrod's (I found a jacket there with the price tag of my Master's degree....) and a bunch of French, Italian and local coffee shops, and probably other areas that I had no idea what name they were or I have now forgotten.